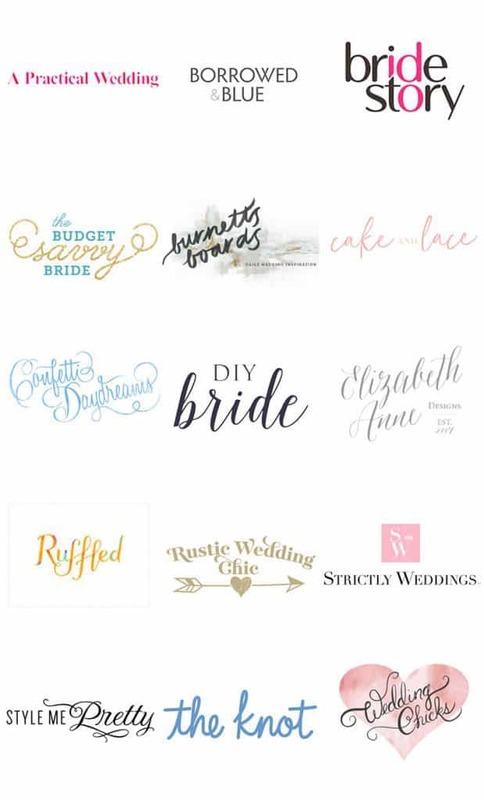 Budget brides rely on easy wedding flower designs to create their own affordable bouquets. 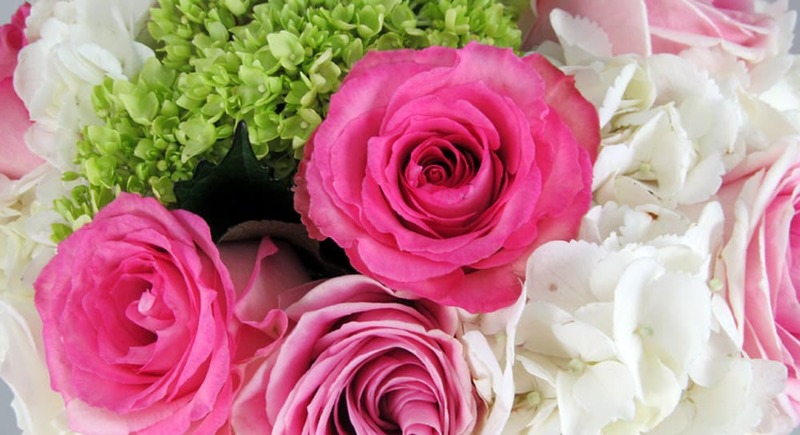 This bouquet tutorial is shows how to stay in budget and make simple flower arrangements by utilizing large flowers in bright colors. 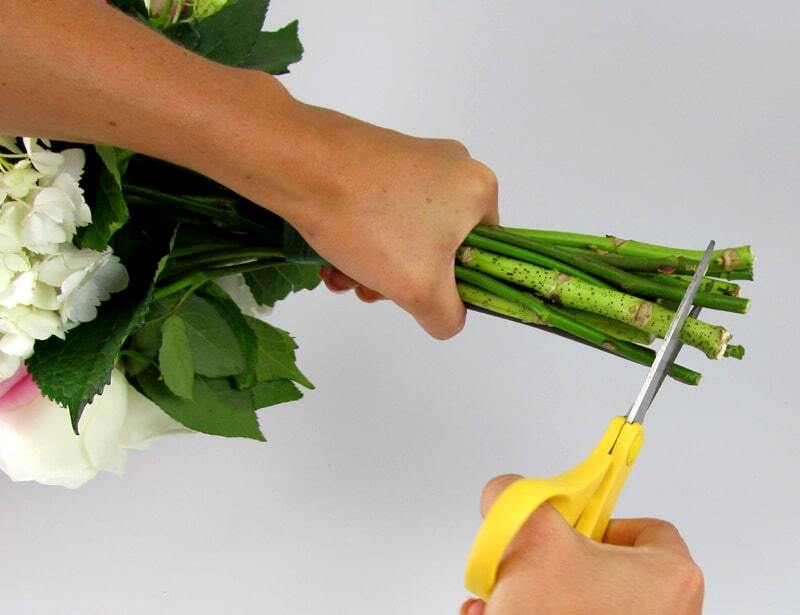 Using a few large flowers will cut down the total amount of flowers needed per bouquet. 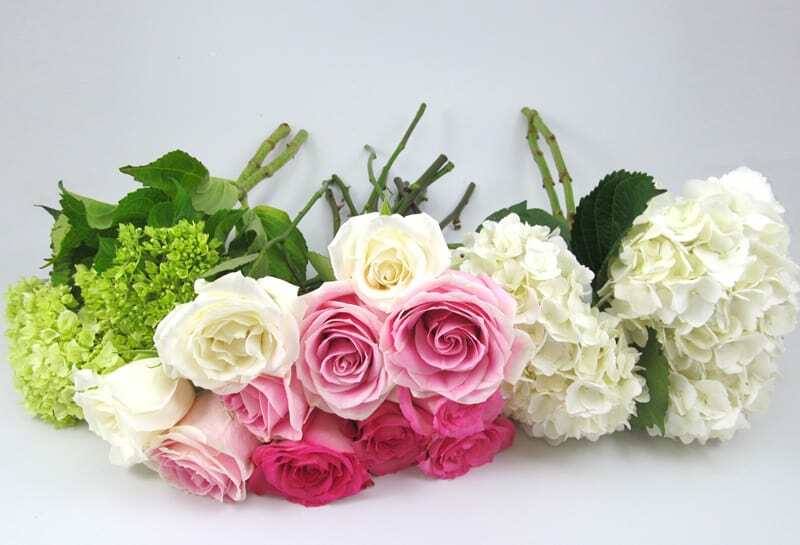 Check out the pictures and read the step by step instructions to learn how simple it is to make professional looking bouquets when you order wholesale flowers online. 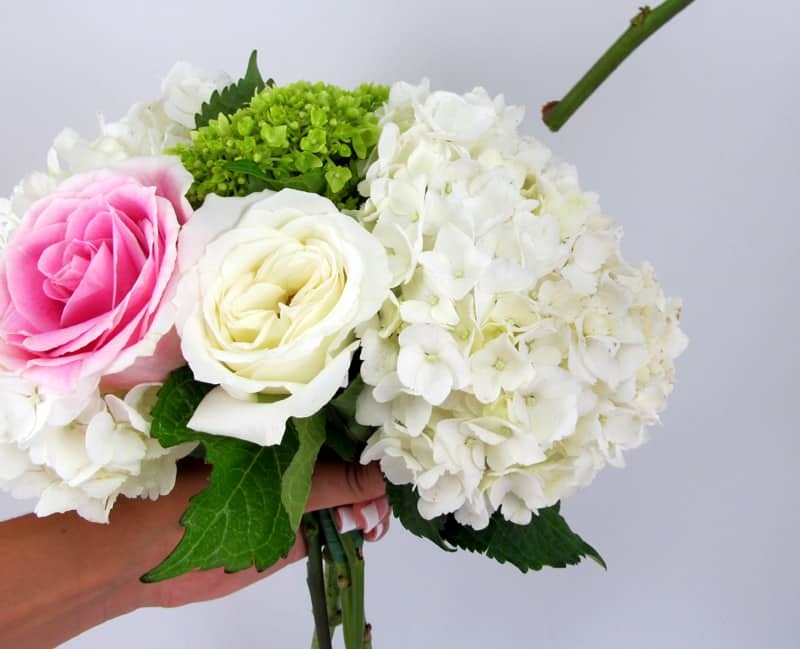 This bouquet features (from left to right) mini green hydrangeas, eskimo roses (40cm), rosita vendela (light pink), and rose sweet unique (pink), and large white hydrangeas. 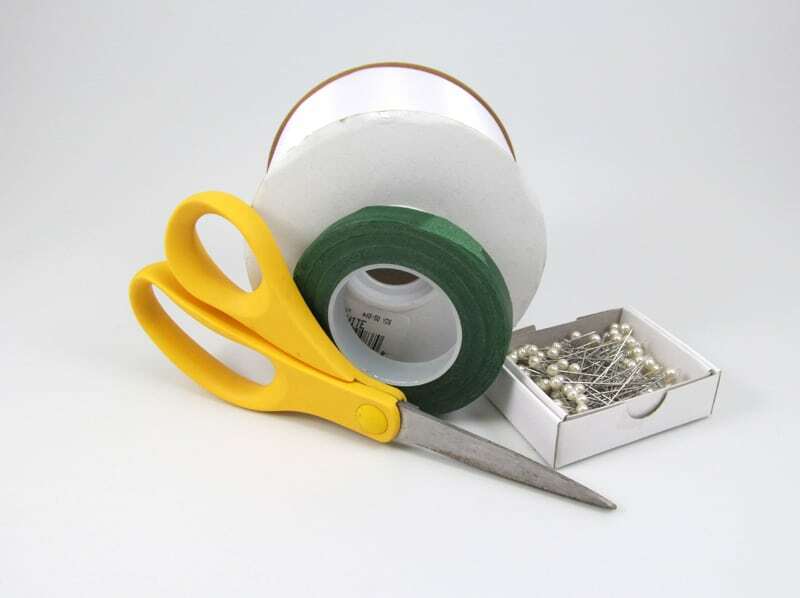 The supplies you will need include oasis floral scissors, 1/4 inch floratape stem wrap, white ribbon, and 1 1/2 inch corsage pins. 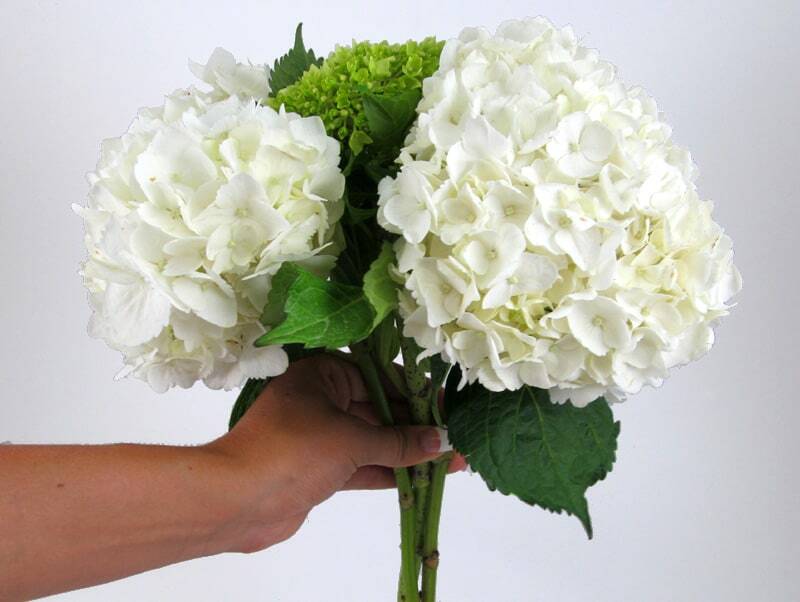 Gather 2 large white hydrangeas and 1 min green hydrangea , wrap the 3 stems with floral tape to secure the center of your bouquet. 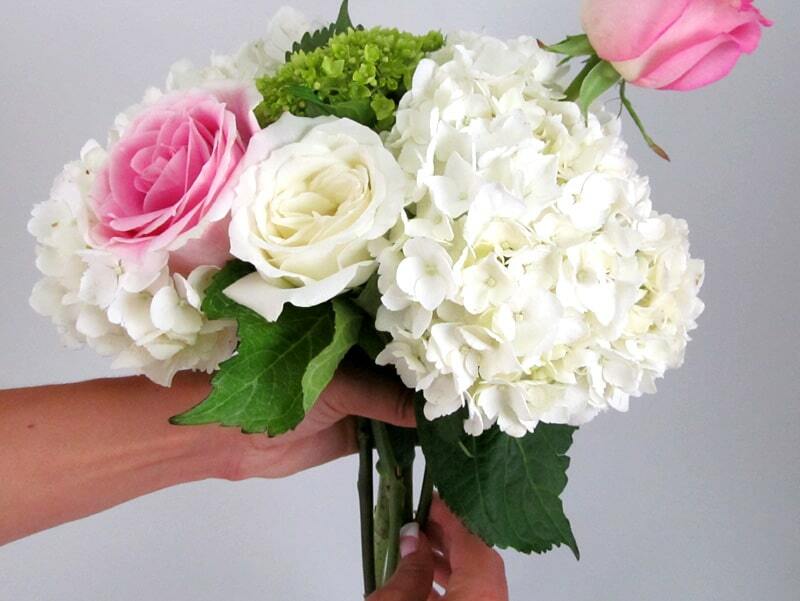 When using large flowers like hydrangeas with smaller flowers like roses, threading is an effective technique to create and even patterned bouquet. Insert the very end of the stem through the florets of the hydrangea and thread the stem through just like you are sewing. 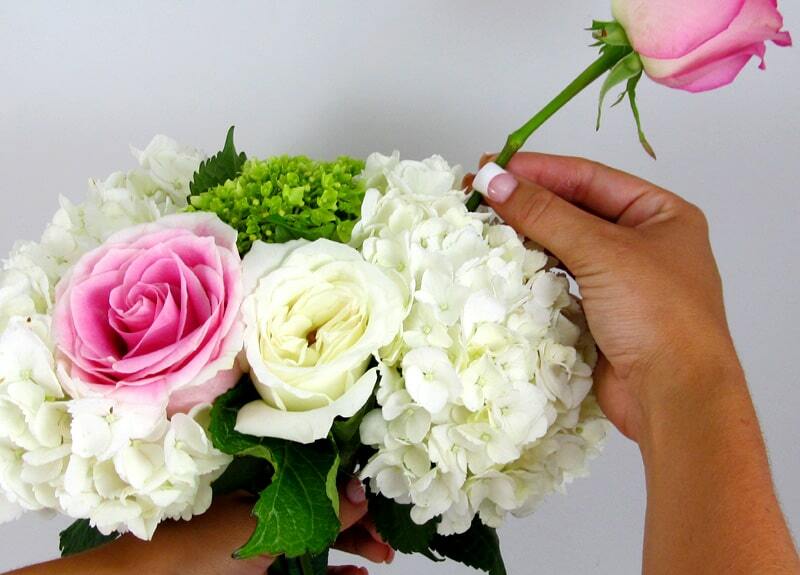 Grab the stem and pull it through the space in the hydrangeas, just like putting a needle and thread through fabric. This will allow you to have roses poking out of the hydrangeas which will help you make a more consistent color pattern. 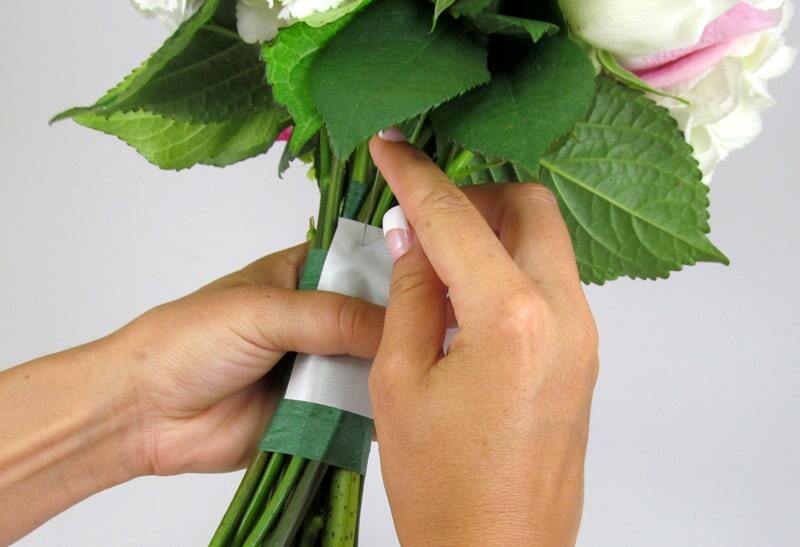 Continue to add to your pattern and secure the flowers with stem wrap. 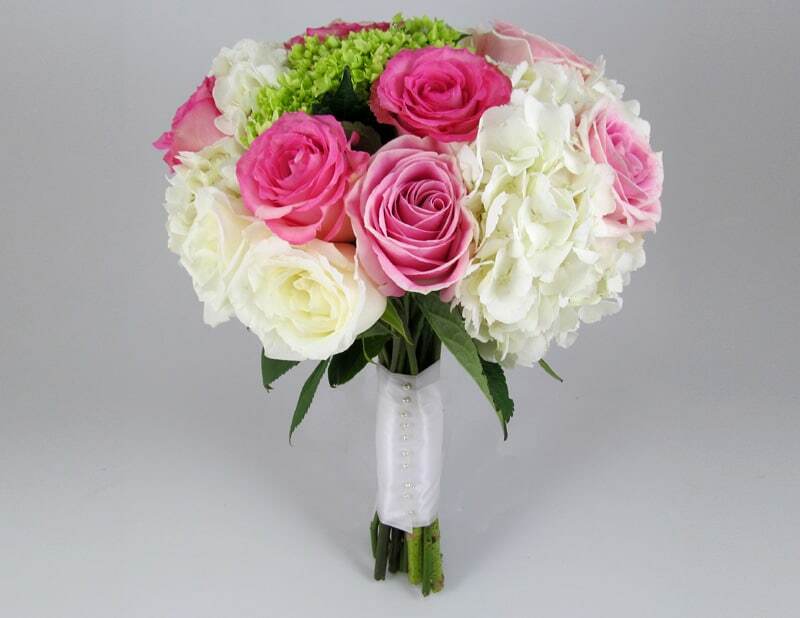 Once you have created the size you desire, use stem wrap to secure all the flowers together tightly. Next, cut all the stems so they are the same length. There are many ways to secure ribbon and create your bouquet wrap. You can use corsage pins to create a beautiful corseted look or you can use floral adhesive to hide all mechanics. When using corsage pins make sure you are pushing the pins into the stems vertically so the ends do not poke out the other side and injure the bride or bridesmaids. Do you have this in a flower package where you can order all together? 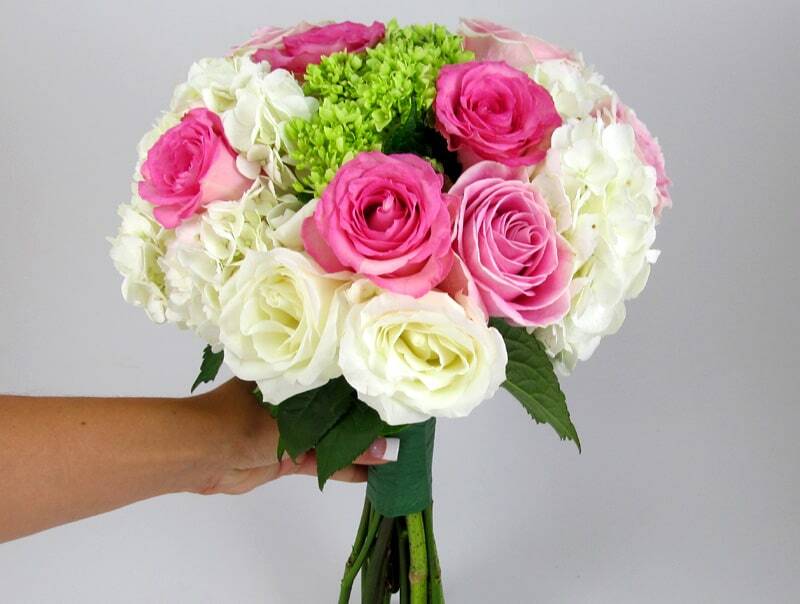 Or does each type of flower need to be ordered separately? Thanks! We do have many Wedding Flower Packs with similar flowers choices, but if you want the exact flowers, you can order them individually! You can find links to the flowers in the post! It seems a simple flower arrangement but very beautiful, have videos on Youtube to see this technique? Unfortunately we didn’t make a video for this bouquet, but here is another video with the same techniques and similar flowers! Hello Amy! You can make this the day before and store them with one inch of water in a tall vase! This way only the bottom of the stems touch the water! Very informative and also innovative post. This tutorial will help lot of people who are new in this field. I don’t think that you need to make any video for this bouquet because the way you define and present this technique anybody can easily understand the process of making this bouquet.